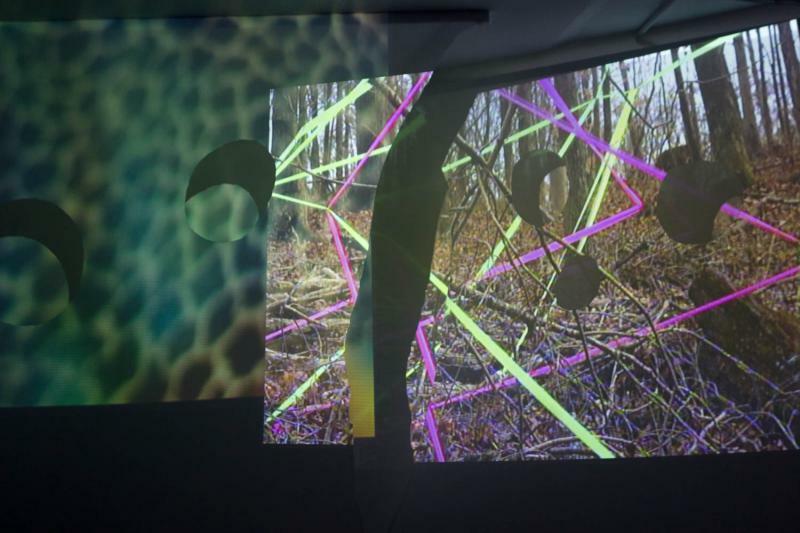 How Easy is a Bush a Bear is a two-channel video installation confronting conditions of visual perception, using bold, colorful, and patterned source material. 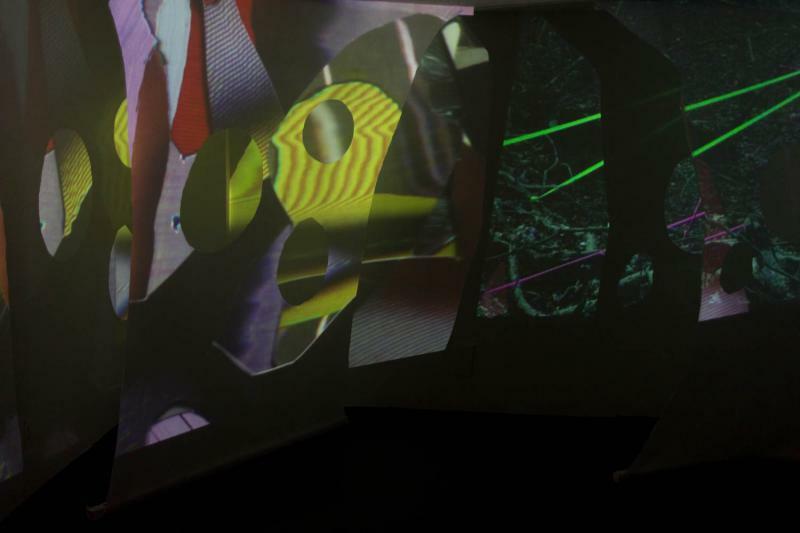 A false wall, punctured with amorphous viewing holes, separates the viewer from the video projected onto the rear wall, while the viewer is inundated by a cacophony of image and sound that repeat and recombine in an endless, yet non-repetitive loop—algorithms determine random combinations of images and sounds, so the installation is constantly fluctuating, changing moment to moment in an exercise of temporality. 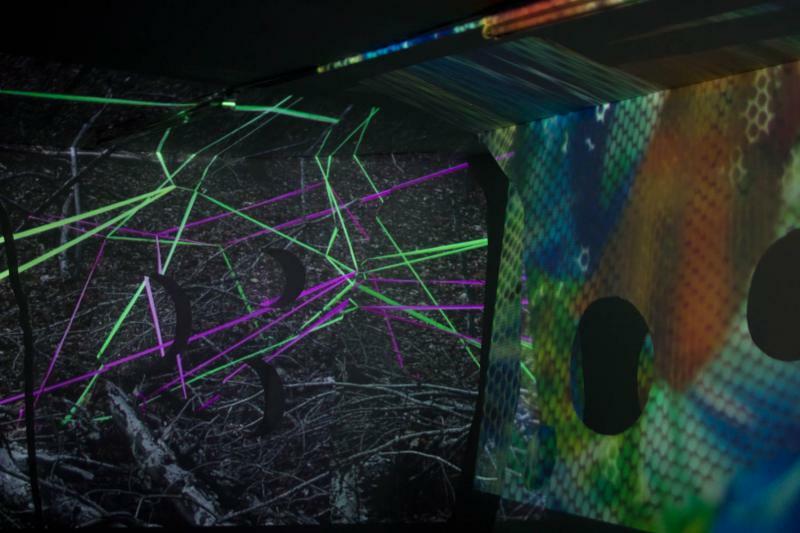 The videos are composed of planes of fabric suspended close together, cut into in various ways and lit evenly to minimize the depth. Martins relies primarily on boisterous, conflicting fabric patterns to create a kind of visual collapse and disorient the viewer. 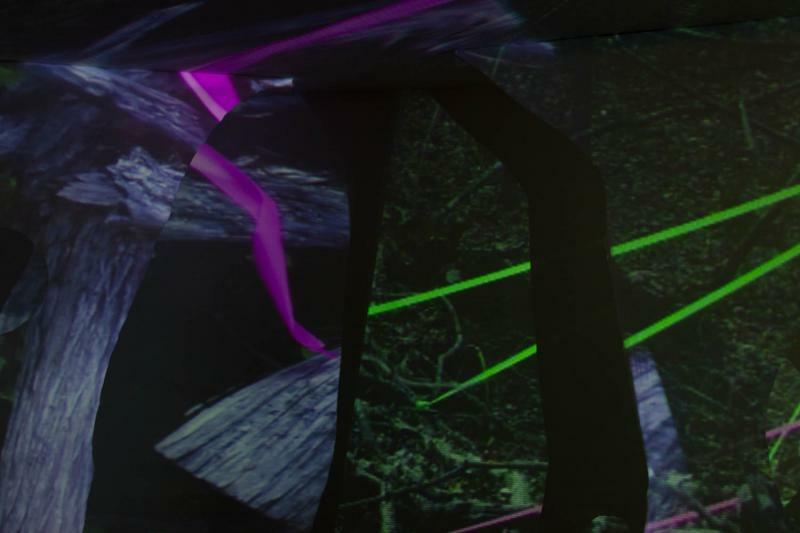 At 6:30pm on Thursday, April 7, THE SUB-MISSION will host a simultaneous-reading performance based on hallucination descriptions appropriated from clinical studies, followed by a discussion with SUB-MISSION Committee Member and Chicago Artist’s Coalition Programming Director Teresa Silva. 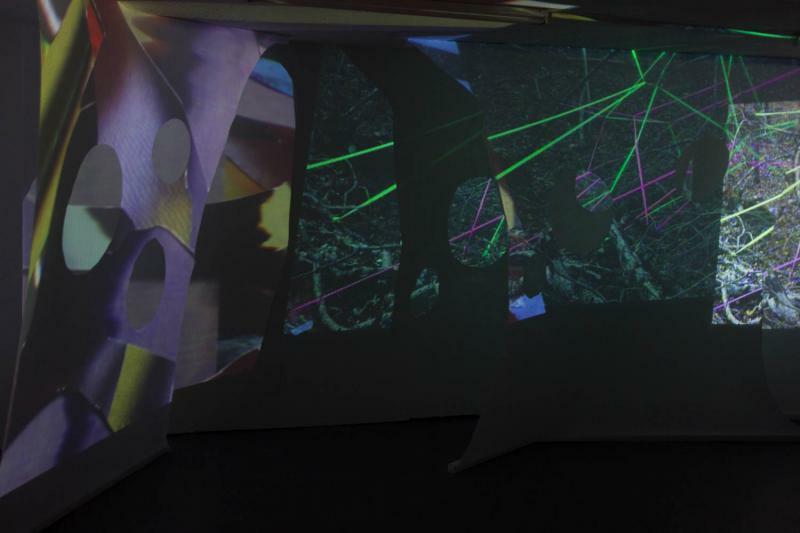 On Saturday, April 23, THE SUB-MISSION will host a closing reception from 3-5pm, and a screening in collaboration with The Nightingale, an experimental film venue located at 1084 N. Milwaukee Ave. 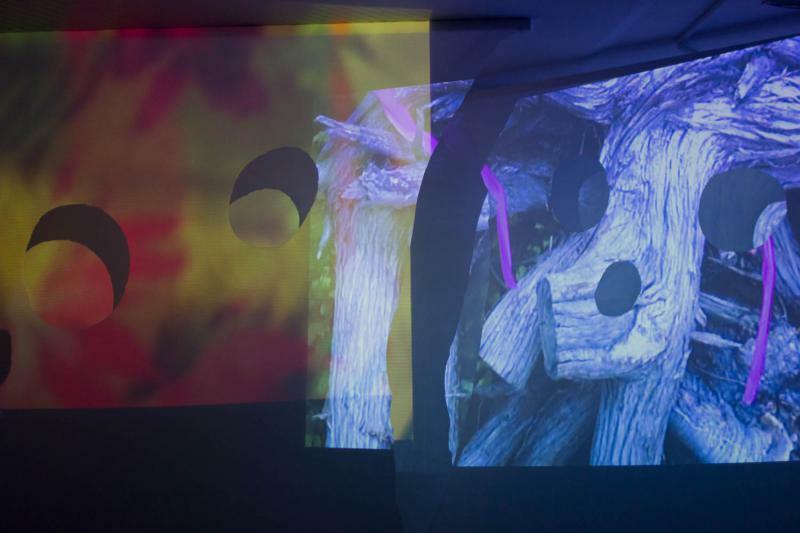 The Nightingale will host the screening of short moving image works related to themes of perception and camouflage at 5:30pm. JORDAN MARTINS is a Chicago-based visual artist, curator, educator, and musician. He received his MFA in Visual Arts from the Universidade Federal da Bahia in Salvador, Brazil in 2007 and has been an instructor at North Park University since 2008. He co-founded the Comfort Music series in 2011, and is currently co-director of the Comfort Station, where he oversees general programming, gestates new projects, and coordinates partnerships with outside organizations and artists. As a musician Martins collaborates with Angela James and Quarter Mile Thunder, in addition to improvised performances with musicians from varied backgrounds. He directed the Relax Attack Jazz Series from 2011-2013, serves on the programming committee for the Chicago Jazz Festival, and curates visual art at Elastic Arts.